It's a fact: fall is the season for muskie. The chilly autumn months–especially in prime muskie regions such as Minnesota and Canada–bring freezing winds, the possibility of ice, and sometimes hours of searching before you hook into that first monster. While seeking elusive muskie in the fall can be a demanding endeavor, all it takes is one tremendous fight and the sight of those wicked teeth at the boat for any angler to immediately dismiss the unfavorable weather conditions and give thanks for being on the water. Many seasoned muskie anglers will switch to trolling in the fall, targeting fish lurking in deeper water, as well as fish feeding on baitfish. Do not completely rule out casting, however, as anglers whose fingers are able to endure the harsh cold during early fall will be able to hit structures and spot fish other may miss, or can't fish, while trolling. However, whether you're trolling or casting, be sure to work your baits slowly since, as with most fish species, muskie metabolism drops with the temperature. A popular fall lure for muskie is the jerkbait, and a good jerkbait will suspend at its depth and rise slowly on the pause. It is this sudden pause in the bait's erratic movements that will trigger strikes from any followers. Around structures, large minnowbaits, crankbaits, and even spinnerbaits will work when retrieved steadily, with several pauses, to entice hesitant fish. You can also troll with large versions of these lures if you like. There aren't any magic sizes when it comes to choosing a lure, but generally, the bigger the better. The larger size will make for a larger profile in the water, thus producing more noise and water displacement, which will attract those fish seeking to bulk up for the winter. As far as colors go, lures patterned after walleye, perch, and shiners–as well as bright colors like orange, chartreuse, and even pink–are proven choices. Now that you've found your bait and your technique, where are you going to find the fish? Well, there are several staple locations that fall muskie stalk and where you'll undoubtedly stake your claim on the water. Any remaining weed beds will be where you'll want to start searching for these ambush predators early in the fall. 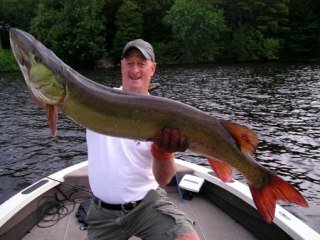 Baitfish will be seeking these oxygen-rich locales and where you find baitfish, you'll find the muskie lying in wait. Collections of large rocks are prime hot spots, literally, when fall temperatures drop. These structures retain heat from the sun and make the water nearby a degree or two warmer, which attracts all types of fish, predator and prey alike. One last thing to look for when hunting for muskie is baitfish schools. It helps to have an electronic fish finder on hand, as you can clearly tell the depth of the school, as well as the location of the muskie feeding on the school. When you find such a school, try to troll around it with your baits set above where you see the muskie, as they prefer to strike from the side or from below. These are just a few tactics you'll want to employ when braving the ever-falling temperatures and brutal weather that commonly accompanies fall muskie fishing. If you can withstand the cold, know what to look for on the water, and can utilize a bit of patience, that first big fish will warm you up like a cup of hot chocolate on the couch never could.